Poet, engineer, scholar, sculptor, warrior, painter, architect, smith: Toln Surenchar had many talents, a mind unsurpassed in his generation, and a case of legendarily incurable wanderlust. He was born in the Periphery territory Desilvair though he didn’t stay there long. Surenchar’s family were players in a travelling actor’s troupe and before he came of age, he had journeyed further than most folks will in their entire lives. His skills were evident early on, he was painting the backdrops for his family’s performances by seven, had radically redesigned their travelling stage into an intricate collapsible marvel by ten, and had written twelve plays, including three that are still regarded as masterpieces, by the time he was sixteen. Surenchar eventually struck out on his own, roaming the land as the fancy took him, first east deep into the Empire and then back into the Periphery every few years, turning his prodigious talents towards countless projects for a myriad of patrons wherever he happened to find himself. He built Drudges that could sing, designed buildings that could dance, and created art that could make stones weep. Such talent never goes unnoticed in the Empire and soon his name was regularly spoken amidst the highest circles of society, till at last, it came to the ears of the Emperor himself. Surenchar was summoned to court and commissioned to produce a new work worthy of the August Throne. As the Emperor Sulyin was fond of falconry, Surenchar crafted a wondrous bird of seemingly living steel that could accurately respond to complex commands. The court was stunned, the Emperor enraptured, and the Bureaucracy swiftly sought to bind Surenchar to the royal palace indefinitely. Intrigued with palace life at first, Surenchar was content for a time, but all too soon the petty rivalries and constant jockeying for position of those about him wore thin, and he felt the urge to move on. His formal request to withdraw from service was harshly denied: he was forbidden on penalty of death to ever speak of it again, Surenchar’s was to be a lifetime appointment. Surenchar’s response was severe; he destroyed the wing of the Hall of Reflected Transcendence in which he was staying, killed a dozen Imperial Guards, and escaped the capital by unknown means. Perceiving that there was only one course left to him, Surenchar headed west, passing beyond the Last Horizon with chartered bounty hunters riding close behind. Surenchar’s hunters hounded him across the West, forcing him again and again to move on, till at last, his strength all but exhausted, he arrived in the Istralene Valley. The Sleepless Scriveners took in the battered artist and soon misdirected or killed any that came to their valley seeking him. Many long months later, Surenchar had recovered himself and sought in his gratitude to craft a gift worthy of the martial scribes who had saved him. The Scriveners told him that all they asked of their guests was to share something of who they were, and to pass on some of the lessons the world had taught them. Surenchar went very still, his eyes focused on something only he could perceive, before slowly nodding. The next day, he travelled west, high into the Eagles’ Claws, searching for some elusive alignment of stone, wind, and sky in which to set up a forge. He found it. Over the following half a year, Surenchar forged four blades of surpassing excellence. With each creation, his skill grew; his first effort was priceless, his final flawless. 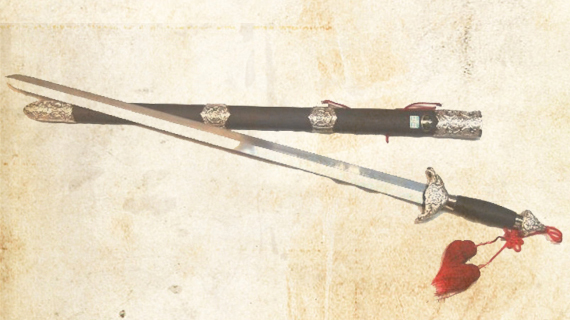 Each weapon somehow managed to reflect the nomadic spirit of its maker and when he presented them to the Scriveners, the delighted monks named each one accordingly: Wandering Falcon, Roving Tiger, Drifting Storm, and Rootless Dragon. Collectively, they are known to those that walk the Dust Road as the Restless Blades. Not long after he presented the blades, Surenchar disappeared north of the ‘Claws, vanishing from recorded history. As to his legendary blades, though on many occasions they have loaned it to a worthy hero for a specific cause, Drifting Storm always manages to return to the Sleepless Scriveners. Wandering Falcon was the first of the blades, more of a long dagger than a sword, and it was gambled away long ago. Rumor has it that it is possessed by a member of the Jade family. Roving Tiger was shattered on the field at Ash Ford by Hadyon Herld as he thrust it through the supposedly impenetrable chest of Rairdos Ironskin, before breaking it off inside the wound. The shortened blade was eventually reforged and christened Bleeding Tiger. Its whereabouts, as well as those of Surenchar’s masterpiece Rootless Dragon, are presently unknown. Many have sought the resting place of Surenchar’s forge, none have ever found it. Another legend, more blades and an expanding universe. Wow, this is truly awesome, I love the concepts of the weapons that have been introduced so far, each seems a character in its own right more than a simple weapon. I love this! Great story hooks to use and beautifully written. Are the Scriveners set to appear again? Awesome legends and background. I’ve already thrown money at the kickstarter prior to reading any of this. I’m glad I did.